Home » Uncategorized » A Dangerous Place to Be! A Dangerous Place to Be! One Friday evening last month, John Nevison the highwayman was forced by circumstance to hide with the good people of the Sandal Community Association. Yes, the constables and watchmen were after him again – his life seems to be one long hue and cry! This was a somewhat different experience for him, for his most oft’ preferred choice of refuge is in schools, where he can tell the children all sorts of adventurous stories about his life, after which the scholarly children can correct the many libelous accounts published in new-sheets and chap-books. This time the company were somewhat older – on average about six times older – yet they too enjoyed all the same stories! What he couldn’t have known, however, was that it would eventually be at Sandal, in the Three Houses Inn, that he was arrested and taken to York for trial and execution! Had he known this I doubt he would have felt anything like as safe! Of course, the history of his capture was exactly why the folk of Sandal were particularly interested in him – perhaps that’s why they had wry smiles on their faces as he described in colourful detail how gentlemen of the road were hanged for their crimes? The evening was a sellout. The organiser, Richard Taylor, afterwards wrote: “Thanks for giving us such a great evening last night. It went down very well with everyone.” The evening even got a picture and an article in the Wakefield Express, although when I showed the newspaper to my boys (5 and 7) they seemed very underwhelmed. After all, what’s so special about a photo of dad? 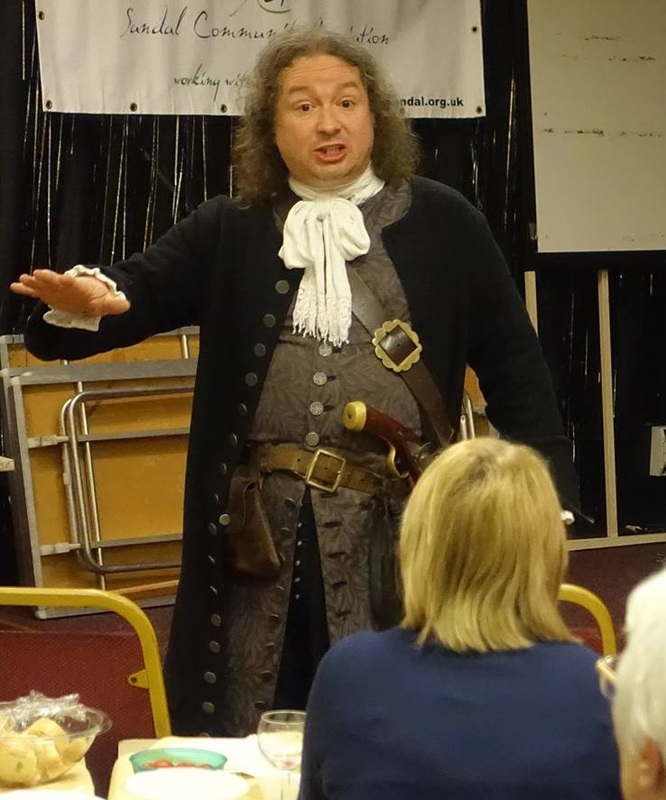 Please click here – highwayman – to find out more about visits from the famous John Nevison.